There comes a time in our lives when cheating on ourselves is no longer acceptable. When you look at what’s happening in the world, it’s becoming obvious that we’re shifting into an era of greater authenticity and consciousness. This movement is not coming from the authorities, it’s coming from those who previously listened to them. The power created by fear can never last, as long as the human spirit is alive and kicking! Listen to the audio of this blog on Youtube I’ve included a free self-acceptance meditation at 11min29sec, which is also published below. It will leave you feeling blissed out! In 2017, we are in a Universal 10/1 Year of New Beginnings and finding our tribe. Find your 2017 forecast. Each of us has a golden opportunity to forgive our family-of-origin and expand our family-of-creation. As they say, ‘home is not where you come from, it’s where they understand you.’ Read more on forgiving your parents. As a Master 11/2 Lifepath, my purpose is to experience and create healthy relationships during this lifetime. This means that I often receive information via new and challenging conflicts. Find your lifepath using your date of birth. Recently, I’ve attracted some disputes, which have taught me about ‘exploitation versus balanced giving’. As someone who used to over-help others and underfeed myself, it’s been a timely reminder ‘there are no exceptions to karmic law’. Essentially, I’ve realised (yet again), that ‘when you insist on giving people a piece of your mind, you’re rarely sharing love from the heart’. Doing something out of guilt or confusion, just creates more grief in a world where so many of us already feel inadequate. They say the squeaky wheel gets the grease – I say, perhaps it doesn’t always need it! When you over-give to those who want your help, you often under-give to those who actually need your help (like your loved ones, your physical body and your innermost dreams). It’s this type of sacrifice that leads many people (especially healers) to premature burnout. The line between guiding others, and absorbing their sorrows, is a fine one. Please understand, It’s a myth that people need to like you. No one can like you more than they like themselves, so 100% approval is an impossible mission in a world of diversity. To experience contentment, you need to stay on your path of development, rather than trying to pull other people off theirs. You will lift us much higher with your stories of inspiration than your tales of martyrdom and perspiration. The English language is a funny beast. I hear people say ‘I hate letting people down’, and yet this is what bus drivers do, day after day. They ‘let people down’ at their stops, in order to pick up others, who need their help more (and are willing to pay for the privilege). After all, there’s only so many seats on a bus. If only the rest of us could be so objective! To be clear – I’m not saying you should ‘put people down’ through gossip and ill-will. After all, having negative thoughts about someone is like shooting bullets at their aura. In these circumstances, it would be better to cut the energetic cords through counselling, using Australian Bush Flower Essences (I love their Space Clearing Essence Mist), meditation etc. Listen to my free meditation for connecting with your Soul. I’m also not saying you should give up on things or people, just because they are difficult. I’m simply suggesting that, healthy people know when to say no to outrageous demands – they understand that a no to others can be a yes to themselves. In my life, I’ve upset SO many people with my choices to become a psychic, have a baby before marriage, talk about 11:11 sightings and numerology in public – the list is endless. Yet now, most of my critics love what I’ve created – they just needed to see the miracles to believe in them. 1) You will live longer and more fruitfully. As a psychic reader and ex-fundraiser, who’s worked with some of the physically (and/ or spiritually) richest people around, I’ve learned that ‘wealthy people don’t waste their energy, time or money’. They know that one leak in a relation-ship can sink their dreams. So they tend to cut you off if you repeatedly fail to keep your promises. We all have 24 hours a day, and it’s what you do today, that determines how free you’ll be tomorrow. My suggestion: Keep a journal with three columns: Felt Better/ Felt the Same/ Felt Worse. Each time you talk to someone, notice how you feel afterwards. At the end of 7 days, review your findings and commit to spending more time with those in the ‘felt better’ column, and less with those in the ‘felt worse’ list. You may be surprised at what comes out of this exercise! Hint – if you can’t avoid the ‘energy takers’ in your ‘felt worse’ list (e.g. they are your partner/ boss/ major client/ family etc. ), it’s time to have heart-to-heart conversations with them, and perhaps a counsellor. If they are meant to stay in your life, they will change, given enough time and space. 2) You will be a better role model for those following in your footsteps. We teach people how to treat us. When we ‘reward’ those who dump on us by passively listening, we encourage them to drown in their sorrows instead of learning to surf their feelings. We also teach them to drain other people’s goodwill with their sob-stories – that’s no good for anyone’s self-esteem. Google ‘active listening’ for tips on dealing with these folk. Please note, I’m not saying to ignore the people in your life who give you constructive feedback. If your wife keeps telling you to get that mole checked, she might be speaking from intuition. Common sense still applies. I can tell you, I would have quit psychic work after the first year if I had a) not raised my prices several times, and b) not rejected the clients who wanted freebies and didn’t respect me (e.g. texted me at 2am or demanded a reading NOW). Even now, I still turn down or refer people every week, in order to work with the clients I like connecting with. That’s normal for someone who’s working at a professional level in any industry. My suggestion: Think about the last day of your life. What would you want to say to your family/ partner/ kids/ friends/ clients/ total strangers before you go? Write down some key messages (they have to fit on a one page obituary). Now – ask some trusted people if they think you’re living these values. Sit with the answers. Don’t be afraid to admit if you feel off track. We must be thirsty before we look for the river. If you identify that you’re out of integrity, I urge you take one action each day for the next month to get back on track. You’ll not only feel amazing, you’ll be lifting the vibration of the place where you live and all those who know you. This practice helps you embrace your passions instead of pushing them away in an effort to fit in. 3) You Will Dissolve Your Fear of Rejection – the greatest gift of all, is the remembrance that you are a spiritual being, who can never be truly harmed. Every time you go through the fire of conflict, or the murky waters of fear, you remind yourself that nothing is permanent except your essence. This too shall pass. I look at life, much the way I look at parenting – a series of messes to clean up, and countless opportunities for fun between the nappy changes and sleeps. When I first gave birth to Forrest in 2016, I was deeply scared that he would die, that I would die, or that I would stuff him up – I was a big bundle of fear. The more time I spend with him, the more I accept that life is a series of losses or gains – it depends on what you focus on. Being a parent isn’t easy when you hate confrontation the way I do. There you are, sitting in a plane when your child starts screaming and can’t be consoled. I still remember when I was the one judging the parents of kids like that. There’s a saying that ‘you become what you judge’. Let’s just say, I now understand the meaning of ‘those who matter, don’t mind, and those who mind, don’t matter’…you can really see someone’s level of compassion when your kid snots on them! My suggestion: If you want to be happy (rather than average), you must find peace with other people’s frowns – only when you detach from judgement can joy arise. 1) Find a quiet place, preferably in nature. Close your eyes and place your hands in prayer position in front of your heart. Say out loud ‘Dear Soul, I am feel disconnected from you. Please fill me up with my true self, and give me a sign if you’re there?’ Wait a few minutes and keep breathing. Notice any tingles, warmth, voices in your head etc. These are all confirmations of Spirit. If nothing happens, that’s ok – just take the time to be in stillness. Connection takes practice. 2) Now place your hands on your body – perhaps your heart, or stomach, or one hand on each. Imagine sending energy into these areas of your body. Say out loud ‘Dear Body, I am feeling disconnected from you. Please accept my love and thanks for carrying me every step of the way. I am so glad that you chose me.’ You may feel emotional, or calm – again these are positive signs. If nothing happens, give yourself a bit longer – you may feel your muscles start to relax. 3) Finally, picture a female Angel standing behind your left shoulder and a male Angel standing behind your right shoulder (if you prefer, you can just make them Angels or colours rather than genders). Imagine they fold their wings around you, totally accepting you just as you are. If you need more love, keep adding Angels until you’re inside a big ball of feathers and kindness. Know that you are always safe. Breathe in deeply and, only when you feel ready, you can come back to the now and open your eyes. When you come from a place of unconditional love, you sometimes say no, in order to serve a greater yes. At times, the best way we can lift someone is to give them a chance to pick themselves up, after we have ‘let them down’. This is what real-life empowerment is all about. Someone with a balanced 4th (heart) chakra doesn’t need to feel special constantly – they’ve let go of their childhood wounding about needing external praise. They give themselves thanks and credit, and are therefore willing to knuckle down and work in a team. This is the dynamic that I’m currently healing in myself. As hard as it’s been, I know that the journey will be well worth the stops-and-starts. 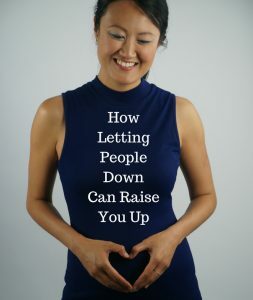 I hope you’ve enjoyed this article on how letting people down can be a gift to them AND you. Remember, we’re not here to make other people happy – we’re here to fulfil our lifepath and assist from a place of overflow. -Ian White (Founder, Australian Bush Flower Essences) and the students at White Light Essences, for inspiring this article. See my palmistry and numerology reading for Ian. –Jacqueline Hannah (couples psychologist in Brisbane) for your support. Also thanks to Kris Anderson, my gorgeous Tarot reader husband and baby Forrest for raising me up, always. Please note, I will be on maternity leave from August/ September 2017. I hope to see you for a psychic reading or numerology workshop before then, otherwise there’s always next year! Save your spot soon with a $100 deposit. Take care and thanks for your support of this blog. -Write me feedback below! Comments will be published once they have been approved.Or, for greater clarity, book a phone or Skype reading with me to discover your soul contract and 2017 forecast. My current waiting list is 6-8 weeks for new clients. it’s worth the suspense – see previous clients’ feedback. Alternatively, please book a Tarot Reading in Brisbane with my husband Kris Anderson. I’m teaching numerology workshops and palmistry workshops in 2017 – bookings are now open.